For busy workers and students alike, Korea’s convenience stores have emerged as favorite spots to grab a quick meal. The major convenience store chains feature a wide range of food -- everything from individual servings of fruit to basic groceries and ready-made meals. Here are a few recipes that are loved by Koreans and widely shared on social media. 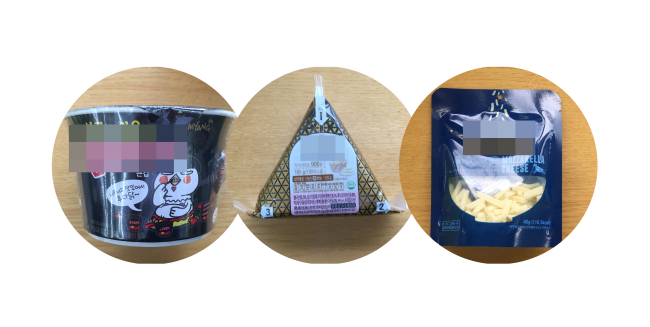 If you had to come up with a list of the most popular convenience store food combinations in Korea, the Mark set would definitely be near the top. A K-pop fan created the dish and named it after her favorite GOT7 member just to get his name out there. “The recipe has nothing to do with GOT7’s Mark, but you must call it the ‘Mark set’ because I’m his fan and I created it!” the founder wrote in a social media message accompanying the recipe. Just as his fan hoped, Mark got more attention when her recipe caught on among young Koreans. 1. Cook the instant spaghetti and tteokbokki. To get the perfect Mark set, it’s crucial to add slightly less water to the tteokbokki -- 1/2 centimeter to 1 centimeter less than the directions call for -- and microwave it for 3 minutes. 2. Cook the sausage in the microwave. 3. Mix the cooked spaghetti and tteokbokki. 4. 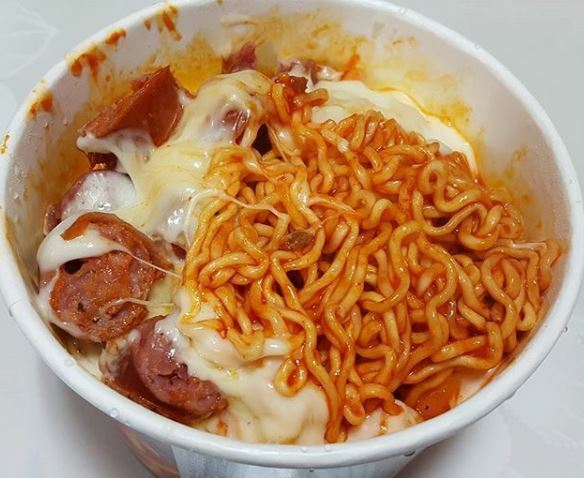 Cut the sausage into pieces, put the pieces on the cooked spaghetti and tteokbokki, and sprinkle pizza cheese on top. 5. Microwave for about 15 to 30 seconds, until the cheese melts. The Banzz set is named after the creator of a YouTube “meokbang” (eating show), because it was Banzz who first introduced Koreans to this recipe. Though he used takeout when he made the very first Banzz set for his followers, he later provided the easy version of the recipe, replacing the ingredients with foods that could easily be found in convenience stores. After he tried the combination, he gave the thumbs-up sign to show he approved. The recipe soon garnered massive popularity among his fans and among Koreans, who enjoy spicy flavors. 1. Microwave the frozen pizza slice and smoked chicken separately for 2 minutes each, and microwave the tteokbokki for 3 minutes. 2. Put the smoked chicken and tteokbokki on the cooked pizza and cover it with string cheese. 3. Microwave for 1 1/2 seconds. 4. Add ketchup according to your preference. If you love spicy food, you must have heard of “buldak spicy chicken ramen.” The ramen, better known as “fire noodles,” is commonly featured on YouTube videos that show spicy food challenges. For those who want the benefits of spicy food but can’t handle the intense burning, Koreans have invented “spicy noodle rice,” which is easy to make from convenience store products. The combination of the spicy noodles, triangle gimbap and string cheese will moderate the crazy hot flavor of the ramen and instantly soothe your burning tongue. 1. Cook buldak spicy chicken ramen and cut noodles into small pieces. 2. Put a triangle gimbap and some string cheese into the cooked buldak spicy chicken ramen. 3. Microwave the whole combination for 15 to 30 seconds, until the cheese melts. 4. Mix well and enjoy!